Its time to game! WBC 2006 is almost upon us. You’ll soon be hip deep in more gaming than most of us do in a year, so before your senses become dulled by sleep deprivation, listen up. If you’re new to WBC, I suggest you read our greeting to newcomers at http://www.boardgamers.org/first.htm. SATURDAY REGISTRATION: Upon arrival, report to New Holland for registration. Yes, even all you Pre-Conners—whether pre-registered or not—will now be getting official with badges and programs before reporting to your event locations—just like the folks who attend the regular WBC. And while you’re there grab a free copy of Knucklebones magazine courtesy of Jones Publishing. Knucklebones is a slick new gaming magazine with a wide assortment of coverage on boardgames. SAMPLER SHOWCASE: New to WBC is this 10-game Demonstration Pre-Con running from 11 a.m. Monday to 5 p.m. Tuesday. It starts with a two-player Attika tournament and then continues with 10 demos of new games in Open Gaming format with boardgames for prizes. A two-round Die Macher tournament on Tuesday is also included. Participation in the Sampler Showcase requires a separate Pre-Con admission or Tribune level membership. See http://www.boardgamers.org/wbc/sampler.htm for details. 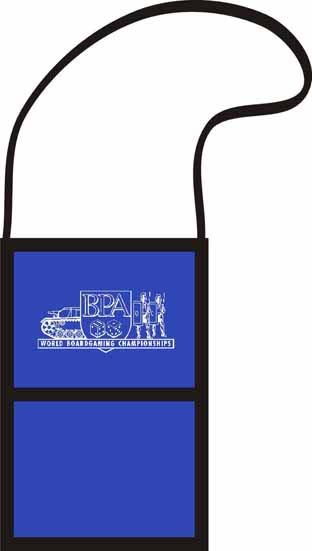 MEETINGS:	The BPA’s Annual Meeting will be held following the auction on Tuesday, Aug. 1, at 5 p.m. in the Lancaster Showroom of Lancaster Host in Lancaster, PA, where we will present the new Board of Directors for your questions. At 8 a.m. on Sunday morning, Aug. 6, the same location will be the site of our Annual Armistice Meeting with the presentation of Awards and Door Prizes. All BPA members are encouraged to attend. JUNIORS: This year before you unleash the kids, be advised that those 12 and under who wish to play in the Juniors events or open game in the Juniors room must be accompanied by a parent or guardian to sign a consent form before being allowed to use the room. We have upgraded the Juniors program thanks in large part to generous donations by sponsors Brian Sutton and David des Jardins with a fulltime monitor, more events and space, and a games library for Open Gaming…so bring the kids. And make time on your schedule Saturday afternoon for a parent/child team event—crokinole which is a form of shuffleboard for finger flickers. See our Juniors schedule at http://www.boardgamers.org/yearbkex/jnrpge.htm#schedule. EXHIBITS: Exhibit tables—not to be confused with Vendors & Sales—are tables reserved for publishers to demonstrate their products, both old and new, and distribute their literature. They may playtest upcoming games or just invite you to Open Game with their products. These tables will be marked as reserved and not used for Open Gaming or events without the permission of that exhibitor. Exhibit tables occupy all of the Ballroom Foyer and the first row of Lampeter. BADGES: WBC uses a deluxe badge holder which comfortably loops around your neck and has pockets for extras like keys, cash or pen. They ain’t cheap tho and we can’t afford to give them away every year, so please either bring your badge holder back from last year AND HAVE IT WITH YOU at Registration, or be prepared to cough up a token $2 fee for a replacement. So remember when leaving this year to tuck that badge holder inside your favorite game to ensure a return trip to WBC next year and save $2. Unlike some years, there will be no pre-reg lists available for GMs to check those who have lost their badge or left it behind. You must wear your badge in order to play. There will be a $5 fee for replacement badges. NEW VENDORS: The Venders Area at WBC has expanded again, and we are pleased to welcome back all of last year’s dealers plus five new (to WBC) vendors to our usual assortment of favorite game publishers. Please extend a warm WBC welcome to Troll and Toad, Northstar Games, L2 Design, Tiger Publications, and Belle & Blade Studios at their first WBC. Remember to save time for a visit to their displays in Ballroom A Friday thru Sunday sometime between 10 AM and 6 PM. Thank these folks for taking the time to attend WBC by checking out their products. Links to their websites are available at http://www.boardgamers.org/bpalinks.htm. Battle Cry was omitted from the alphabetical listing of events. This Single Elimination trial event begins Saturday morning at 9 a.m. in Paradise as listed in the Chronological section of your program on page 20. The Rio Grande release of Antike has been delayed and therefore that Trial tournament is being cancelled. The good news is that it will be replaced by another Rio Grande recent release Thum & Taxis in the same time slot which has just won won the prestigious German Game of the year Award. See http://www.boardgamers.org/yearbkex/t&tpge.htm for details. An unofficial “ghost” tournament for Wizard’s Quest which didn’t make the official cut this year will be held in Open Gaming on Sunday morning at 9 a.m. EVENT PREVIEWS: A number of event previews have posted minor changes since their initial appearance in May. You may want to revisit them at http://www.boardgamers.org/yearbkex/index.htm. GAME SHOW WITH PRIZES: Northstar Games is sponsoring a Wits and Wagers game show with prizes for teams that will be run three nights. Get all the details at http://www.boardgamers.org/wbc/seminars.htm. GM 101 SEMINARS: There are a pair of GM meetings at 3 and 4 PM Tuesday before tournaments begin led by recent GMs of the Year John Coussis and Vince Meconi. If you are running an event or have ever thought about doing so, drop in for the discussion. Get all the details at http://www.boardgamers.org/wbc/seminars.htm. Note that this year Tribune level members may attend any and all Pre-Cons free of charge. All others must pay a separate pre-con admission. TEAM TOURNAMENT: Although there is no event pre-registration (except for the Pre-Cons), pre-registration IS required for the Team Tournament and time is FAST running out. Check out the field this year and your team’s status at http://www.boardgamers.org/wbc/teamtour.htm and remember to post your own score on our self-scoring Team Tournament display in the Ballroom Foyer. RESERVATIONS: The Lancaster Host and our overflow hotels are soldout. Fortunately, there are many nearby hotels. If you have not booked a room, call the Lancaster reservation center toll free at 1-866-729-5132. See our Hotel and Transportation page at http://www.boardgamers.org/hotellan.htm. FOREIGN CURRENCY: Exchange of foreign currency is not available locally. Be sure to visit the Foreign Exchange Office at your airport. While the hotel accepts major credit cards, BPA does not, so convention registration and souvenirs must be paid for in American currency or checks drawn on US banks. There is a $25 charge for any returned check. conditioning be too cool. While we expect the air conditioning situation to be improved over that of our previous site, it pays to be prepared. Check the weather here: http://www.wunderground.com/cgi-bin/findweather/getForecast?query=lancaster,%2Bpa. REGISTERED? NEED A RIDE/ROOMMATE? : Check out the pre-reg list at http://www.boardgamers.org/wbc/prereg.htm. Car pooling to/from airports is an easy way to save money. Pre-registration is officially over but procrastinators rejoice…our busy CD will still accept email pre-registrations for those with Paypal accounts until Thursday. Thereafter, walk-on rates apply. Paypal payments are subject to a 10% surcharge but that is still less than walk-on rates. Inquire at doncon99@toad.net for details. TRANSPORTATION: Amtrak will be the best option for many unable to drive. See the details on our site at http://www.boardgamers.org/hotellan.htm. REGISTRATION DESK: Convention registration is on the lower level in New Holland from Tuesday thru Sunday. The desk will be open Tuesday from 8 a.m. to 9 p.m. Be sure to stop by before departing to pick up any prizes won. SHOW YOUR COLORS: Sat., Aug. 5, is the official Game Club T-Shirt Day. Promote your local gaming group and promote camaraderie by showing everyone which gaming group you are with. You just might gain a few members. Help grow the hobby by wearing your colors. POSTERS NA: Attendees are reminded that absolutely no flyers, posters, or charts of any kind are to be taped, glued, stapled, or adhered in any fashion to any surface at Lancaster Host. Any such materials will be immediately removed. You are welcome to hand out flyers for gaming activities and may leave same at Rregistration for distribution but absolutely no signage of any kind is to be adhered to a wall, furniture or other surface. FLEA MARKETS NA: Attendees are reminded that all tables at WBC are reserved for the PLAY of games by those with a current WBC badge. No unauthorized selling, trading, or solicitation is allowed on the premises. Items left stacked on tables will be removed. SMOKING NA: There is no smoking in public areas throughout WBC. If you need to smoke, please step outside. Do NOT open windows…it only aggravates the air conditioning situation. OUTSIDE FOOD NA: Attendees are reminded NOT to bring outside food and drink onto the premises. Lancaster Host does not allow it. DRINK RESPONSIBLY: Every year the BPA Board wrestles with the problem of alcohol consumption at WBC. While we do not wish to restrict any one’s civil liberties, we must protect the majority (especially the children present) from the irresponsible behavior of a few who imbibe too much. Please restrict your social drinking to acceptable levels, and if you have had problems of this sort in the past, we urge you to abstain altogether. Please report any unacceptable behavior to the registration desk. Those responsible for unruly behavior will be removed from the premises and banned from future attendance. PRIZES: Players are reminded to check the event kiosks in Paradise Terrace to see advancement priority for later rounds. It is not uncommon in multi-player games for non-winners to advance, so if you want to play, always check to see if there are openings in the later rounds. It is not the GM’s responsibility to find you. You must check the kiosk to determine your standing or show up at the next round to check for vacancies. If you do win a prize, remember to pick it up before leaving. Although we hold prizes for pickup next year, we must charge a shipping and handling fee if you want them delivered in the interim. Also, remember to check the back of any Plaques you win for GMT or MMP events for merchandise credits offered by the publisher. KIOSKS: When you first arrive, check the Kiosks display in Paradise Terrace. Each is adorned with a pictorial history of the event that furthers the traditions of WBC. Do NOT sign the entrant lists on the Kiosks—those are strictly for the use of the GMs. There is no event registration at WBC (except for the Team Tournament and Pre-Cons) which is now closed. Later, when you want to see if you’ve done well enough to advance to a subsequent round after a preliminary heat, check out the Alternate & Qualifying lists on these kiosks which should be returned to Paradise Terrace when not in use. Do NOT write on these kiosks! They are expensive—and in some cases the original lidwraps that adorn them are not replaceable. By vandalizing them with your messages you make it that much harder for us to keep prices low and appearances up. If you MUST write on them, use the paper that is taped to them, not the boards themselves. EXPERIENCE LEVELS: You are reminded to honor the experience requirements of all events. Class A (red) events are for experienced players only. Class B (yellow) events allow beginners only if you have read the rules or attended the mandatory demonstration in Paradise Assembly. Do NOT expect to be taught the game during the event. Class C (green) events have GMs who have agreed to coach players during play. Please respect these requirements for everyone’s enjoyment. PLAYING TIMES: Please be considerate of others and play promptly, keeping within the duration of the event’s listed playing time. Failure to do so not only causes problems when the space you occupy is needed for a later scheduled event, it can distress those you play with by making them miss the pportunity to play in another scheduled event. And, of course, it can slow down the entire tournament while others wait for you to finish before they can start another round. Failure to adhere to the scheduled playing times force GMs to make adjudications which neither they nor you will enjoy—especially since we advise heavy bias against those who play too slow. Most event playing times are already on the long side but if you cannot keep up with even that pace, you should probably restrict your activities to Open Gaming. allowed. Sales soliicitations are likewise limited to authorized vendors. have theirs whether you are in a Final or not so lighten up and go with the flow. WEREWOLF: And if you are a late night Were Wolf—pleeease return the rooms to the same state you found them. Every year we consider banning such late night play because of the mess they leave behind. If you like your all night gaming, don’t abuse it. You'll have only yourselves to blame if in the future the meeting rooms are locked at midnight. BRING GAMES! : Lastly, remember to bring the games you want to play! When WBC turns players away it is only due to a lack of enough games. Pre-registration at WBC is now closed but we welcome gamers of all kinds to register at the door. ……… whew! That's done—ok … now you're ready to have fun at WBC. See ya soon. SUBSCRIBE: If you have not yet subscribed to our new mailing list, please do so as we are unable to add you ourselves. To receive our free monthly newsletters you MUST rejoin the BPA mailing list by visiting http://lists.boardgamers.org/mailman/listinfo/bpamail to confirm your address and your desire to be on this list. Subscribing takes only a moment, ensures your privacy, and increases likelihood of receipt. The newsletter will continue to be posted in the WBC folder in the Conventions section of Consimworld and on the BPA web site but will otherwise be unavailable to those who do not join the list in this fashion. Here are previous newsletters: Nov. 2005, Dec. 2005, Jan. 2006, Feb. 2006, April 2006, May 2006, June 2006, July 2006.